In their desalination opportunities summary report to be delivered to the SLO County Board of Supervisors, county staff described “near term opportunities” utilizing existing unused capacity at the Diablo Canyon desal water plant to make available potable water to Los Osos though a new pipeline and/or the northern Santa Maria groundwater district likely through a pipeline to Lopez Lake. The study says the plant could connect to the Avila Beach with a seven-mile pipeline and/or Los Osos with an 11-mile “somewhat more complex”pipeline. By contrast, the Santa Maria groundwater basin requires 1026 acre feet of water to offset urban pumping to mitigate against seawater intrusion there. The desalination plant can provide 500 acre feet of water at current capacity and 1000 acre feet of water at full capacity says the study. The county should move on an “emergency“ basis to work with potential partners on a financial plan and do the preliminary engineering to garner grants and start regulatory approval, the report sayss. PG&E is working to provide cost estimates to the county. County Supervisor Adam Hill says it is likely both watersheds might get relief in a phased program that could start by utilizing an existing pipeline to Lopez Lake. Nevertheless, still to be sorted out is how much the pipelines will cost and who will pay what share? Hill notes that PG&E is more than cooperative – “even enthusiastic” saying the utility may want to get into the water business in the future. What I noticed is the large footprint mapped as Avila Beach. The little community appears to be mapped for future Incorporated Cityhood. Yes, more water would help that end and someday stretch back to the Freeway. Let’s not follow the example of our opinion TV media and jump in with negative comments so quickly. We are in the middle of a dire drought that could take down our State. The New York Times had an article (8/21/15) describing how many scientists say this drought is part of planetary climate change. That means it is not going away until CO2 levels in the atmosphere come down – a long, long time from now. In emergencies we should not mock the efforts of the firemen. 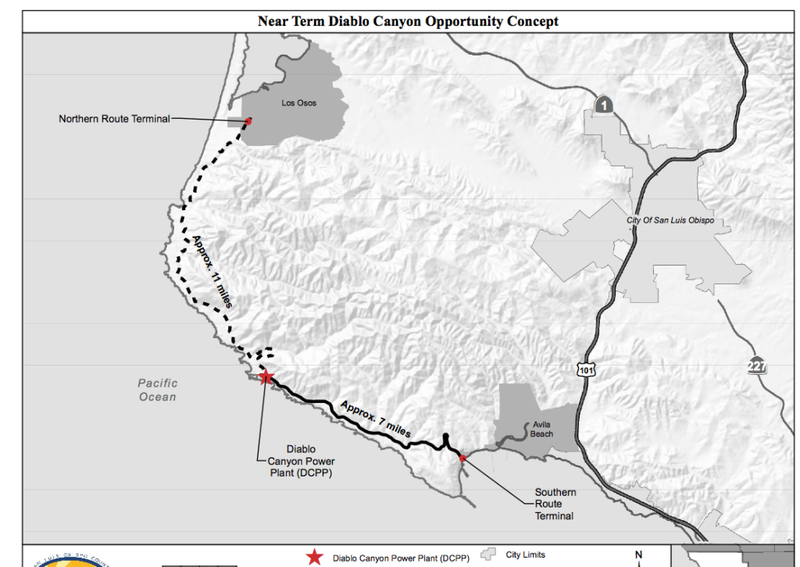 Diablo Canyon has stepped forward to help the community and State. Can’t we compliment them for anything? Of course, money enters into the discussion because someone has to pay for a pipe line and all arrangements to get it working. One can see the fanaticism of the anti nuclear voices when they would forego fresh water in this drought emergency if that will curtain the Diablo Canyon power plant. The plant has served us accident free for 30 years with 2300 megawatts of continuous power, day and night, wind or no wind sending vast amounts of electricity to equivalent of 3 million California homes. Bravo Diablo Canyon Power Plant. Bravo PG&E for stepping up to help our area and State. The great minds behind laying out lots in Los Osos etc. did not concern themselves deeply with things like ‘water and ‘waste’. It was for profit. SLO County and water is not unique. Now we have a problem. No easy fix awaits. Of course PG&E is enthusiastic. Dependency on their desal plant would insure continued permitting of the power plant. Is anyone talking about what will happen when the plant is forced to shut down or if an accident occurs. Does anyone think the Coastal Commission is going to allow an eleven mile pipeline to be constructed across Montana De Oro Park. All a big waist of money. BTW I am not anti-nuclear, just a realist. And I know I misspelled waste. I hate it when that happens.